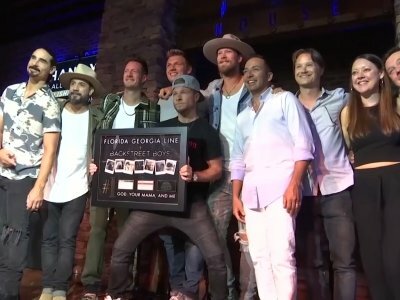 NASHVILLE, Tenn. (AP) — Country powerhouse duo Florida Georgia Line has been dominating the sound of the genre for eight years and setting historical records in sales, airplay and streaming, and they've finally landed a coveted acknowledgement from the Recording Academy with their first-ever Grammy nomination. Three-time CMA Musician of the Year Randy Scruggs died Tuesday at the age of 64, after a short illness. Born the son of bluegrass pioneer Earl Scruggs, Randy went on to be instrumental in the Nitty Gritty Dirt Band's Will the Circle Be Unbroken albums, and win multiple Grammys on his own. He wrote Deana Carter's hit "We Danced Anyway," among others. It's been #1 for 20 weeks now, so Tyler Hubbard talked recently about how Florida Georgia Line ended up writing "Meant to Be" with Bebe Rexha. Ed Sheeran leads the first wave of nominations for the 2018 Billboard Music Awards. The 'Shape of You' singer have received four nods so far for Top Artist, Top Male Artist, Top Hot 100 Song for 'Shape of You' and Top Selling Album for 'Divide'. 'Delicate' hitmaker Taylor Swift follows shortly behind with four nominations for Top Artist, Top Female Artist and Top Selling Album for 'Reputation'. If you missed Jordan Davis performing his breakthrough hit, "Singles You Up," on Late Night with Seth Meyers, you can check out his appearance here. Walker Hayes’ breakthrough top-ten hit, “You Broke Up with Me,” has just been certified platinum by the RIAA. Walker found out the good news Thursday, as he played New York City’s Playstation Theater. In late February, the Regrettes singer/guitarist Lydia Night attended singer/songwriter/producer Bebe Rexha’s Women in Harmony dinner in West Hollywood. Florida Georgia Line touring with Backstreet Boys, a passé boy band, sounded incongruous at first blush, but it somehow worked and filled Target Field and other stadiums.